A couple of weeks back, I mentioned how I had been sidetracked in my search for something in my upstairs storeroom - I had found a chessboard while looking for something else. I thought I would return to the original search this week, so headed upstairs, being determined this time not to allow myself to be diverted. I had partial success; I was able to find the set of drawings I had in mind, but came up short in the hunt for the book that should accompany them. Excavating that particular treasure will have to wait until another day. Each week when I sit down to tell you one of these stories it is usually a simple process for me - I just 'tell you the story' as I remember it. There are rarely any deep ideas being expressed, nor are we usually faced with questions about such things as motivation. Why did Dave do that? But - speaking for myself at least - this week's episode is a bit different. I am sitting here faced with the clear 'evidence' that I did indeed do this thing, but as to just what I was thinking or planning at the time, I have no idea; the entire project seems completely preposterous! 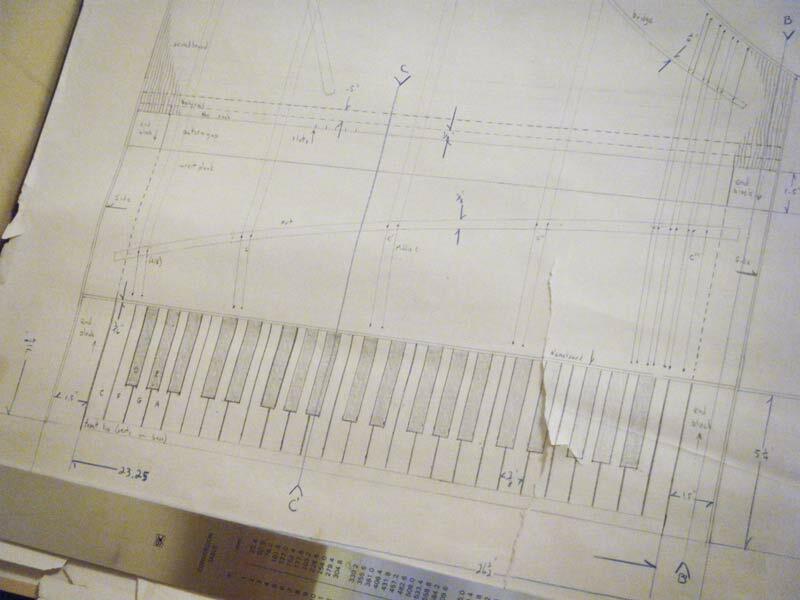 The drawings that I have here in front of me show - in a very detailed way - the construction of two keyboard instruments: an antique virginal and a harpsichord, both of a style common in the sixteenth and seventeenth centuries (a time when Italian makers dominated the field of keyboard instrument production). The drawings are extremely comprehensive, showing pretty much everything from the overall dimensions and structure of each instrument, right down to the smallest details of the decoration. Some large diagrams show the scaling and string length, others are cross-sections indicating how the frame was braced to support the tension of the strings, and we are even shown details of the rosette that was typically carved into the soundboard of such instruments. The book that goes along with the drawings begins - I can remember - with an overview of such instruments and their place in history, and then goes on to give a complete and comprehensive guide on how to actually build them, moving step by step from the basics of gathering the materials, forming and fitting each of the numerous parts, right up to how to tune and adjust the completed instruments. 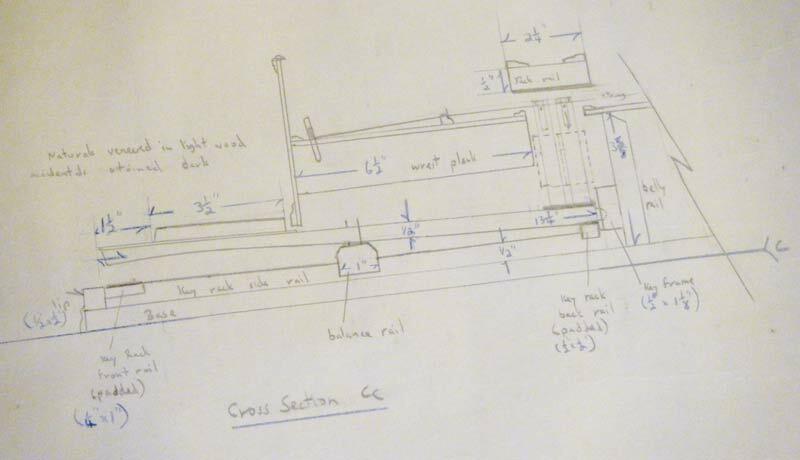 The plans for the virginal are dated February 1976, and for the harpsichord January 1977, indicating that I must have been involved with that project for at least a year, probably longer. Nearly forty years later, looking at these yellowing sheets, the questions begin to pile up. How was I able to do this when I had never set chisel to wood? Where did I learn all that stuff? Was I planning to publish this? And of course the most obvious question, did I then actually build such instruments? The only one I can clearly answer at this point is the latter: no, I never did build them. I certainly intended to; there is another box somewhere in the storeroom upstairs which has in it coils of string wire in various dimensions, and I know that I did actually begin construction and assembly of the frame of one of these two instruments. As for the 'why', I can only surmise that as this was all happening during the time immediately following my ignominious exit from the hotel orchestra (previously mentioned in a number of these stories) that I was considering taking up musical instrument construction seriously. I had previously made (and sold) a number of classical guitars, so it would have been a logical development. But the project must have been cut short when I was offered the position of manager back at the music shop where I had previously worked. These plans were rolled up, the materials went into storage boxes, and here they still are, all these years later. Building one of these might make a good retirement project for me, now that I think about it. But I suspect that if I begin following instructions that were written half a century ago, I'll have plenty of questions to ask the author!